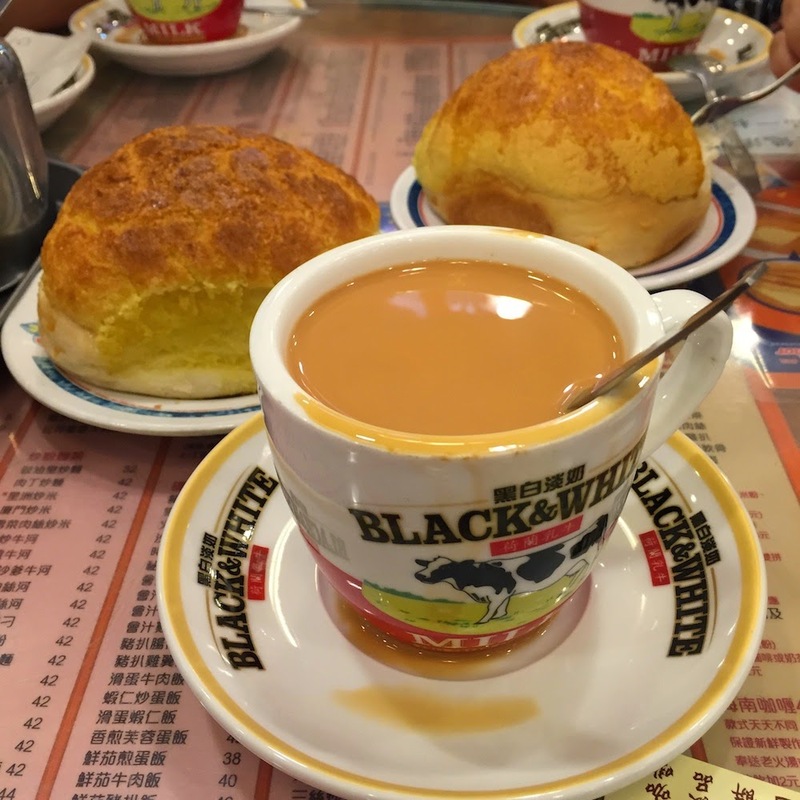 Since I am going to Asia again by end of this month, I thought it was a good time to finally finish my post about what we ate in Hong Kong. We visited Hong Kong last October with my parents. For me, I had one goal in mind and it was to eat. Oh yes, it was also for my mom's birthday so we had to make extra sure she had extra fun. My dad never liked Hong Kong because of the crowds but after this trip, he kind of warmed up to the city. The subways were super crowded while we were there, more than usual due to Occupy Central. Sadly, we couldn't eat at every single restaurant but my for me, I just had to try genuine char siu, wonton noodles, pineapple buns and milk tea. 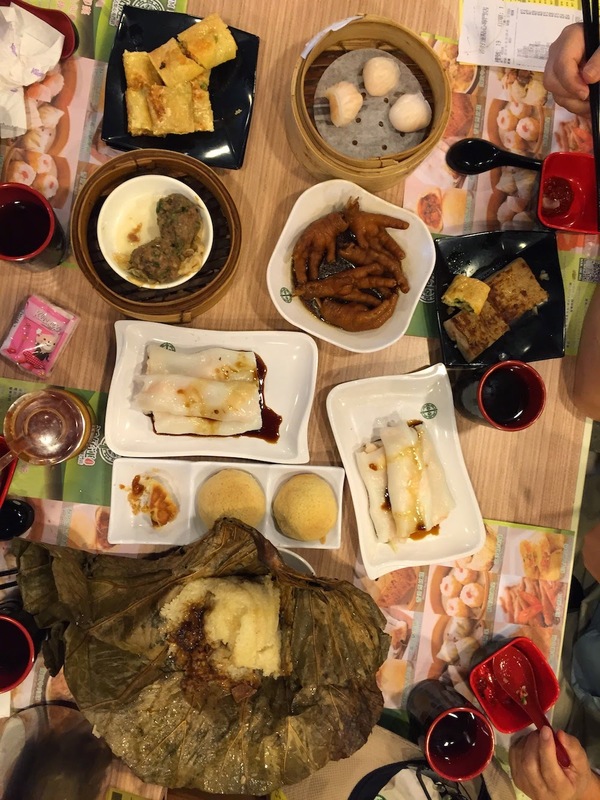 Here is our list (with pictures) of almost every restaurant we ate at! Most of them we liked but a few of them we thought was a waste of our stomach's real estate. We were really picky about what we were putting in our mouth because our stomach can only hold so much food at once. My mom was really funny and always asked us if we were eating somewhere famous or popular. If we couldn't fit it in our schedule and had to eat somewhere not highly recommended or unknown, she ate a bit less and held out for the next meal. She said she just couldn't eat as much as before anymore. 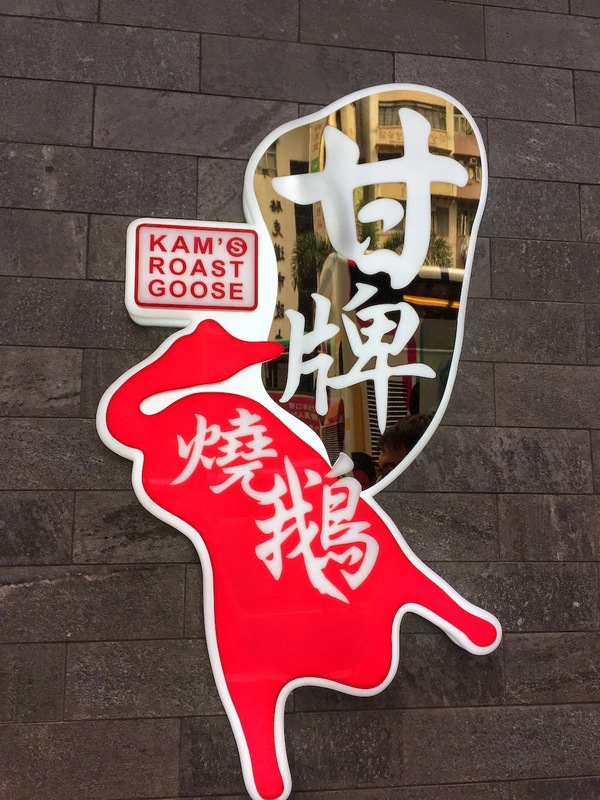 When we got into the city from the airport via the MTR, our first meal was at Michelin-star Kam's Roast Goose which was close to our apartment in Wan Chai. It was recommended by our airbnb host and one of Dave's coworker. We were a bit hungry and wanted to eat something before settling into our apartment. This place was okay. It's a chain and we found the goose to be way too fatty. Where's the meat? Since we already had a meal on the plane, we kept this meal small. 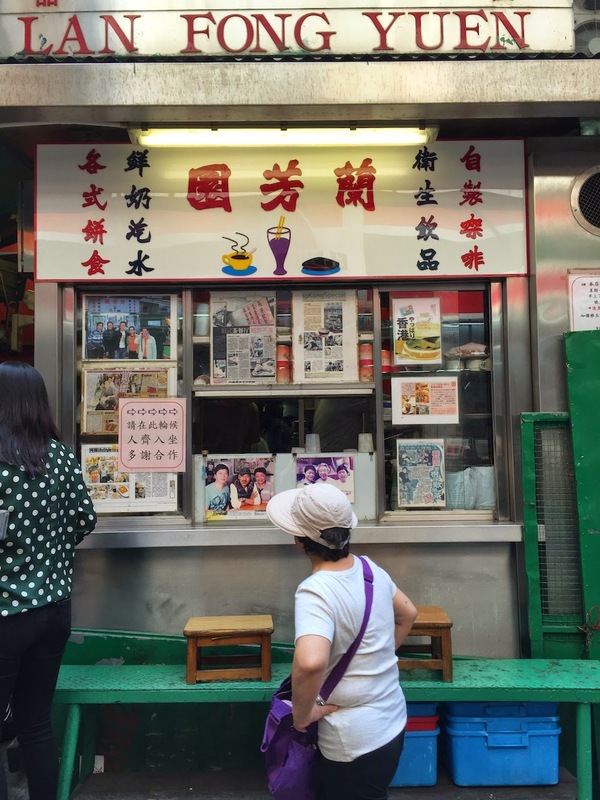 After we settled in our apartment, we headed back out to check out Mong Kok district. We walked up and down a few streets and saw a small section of the large stretch of street vendors. It was time to find a good wonton noodle shop and Dave used Foursquare to find a spot since the recommended ones were a bit far away. 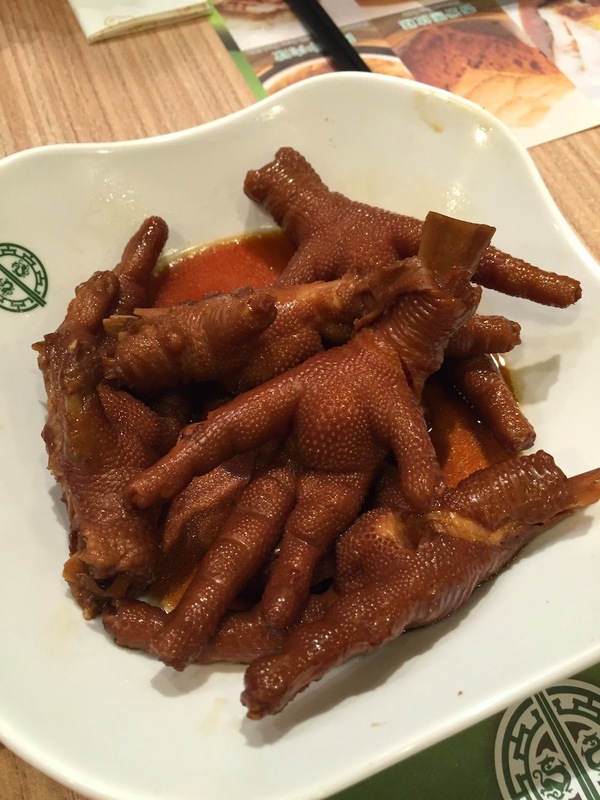 He found Ming Yuen restaurant. 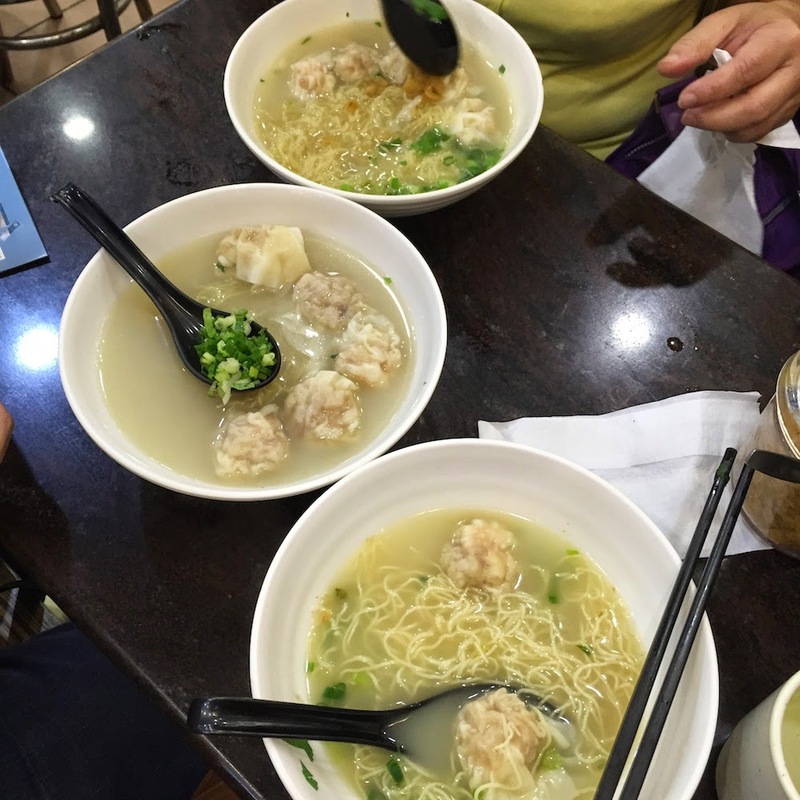 We really liked the wonton noodle soups here. I think our favorite thus far during our trip. After having some mediocre noodle soups, my mom wanted to go back here but it was just a bit too far. We had Pineapple bun cake at Kam Wah cafe. I mentioned it before here in this post titled: Aziz told us to eat here. The next morning (day 2), we went straight to the famous Michelin-star dim sum restaurant Tim Ho Wan aka the cheapest Michelin star restaurant in the world. We went to the one in the basement of the IFC mall as we were told it was the one with the shortest wait. We met up with my long time friend Nikkie who ordered all the good stuff for us. Everything was really yummy. After dim sum, we were ready to head to Macau for the day by ferry boat. We took one of the multiple free shuttle buses from the ferry station to one of the hotels. We went to the Venetian where we spent a few hours wandering. After that, we felt kind of trapped and many of the food recs were not inside the hotels but back in the city. So, food court it was. 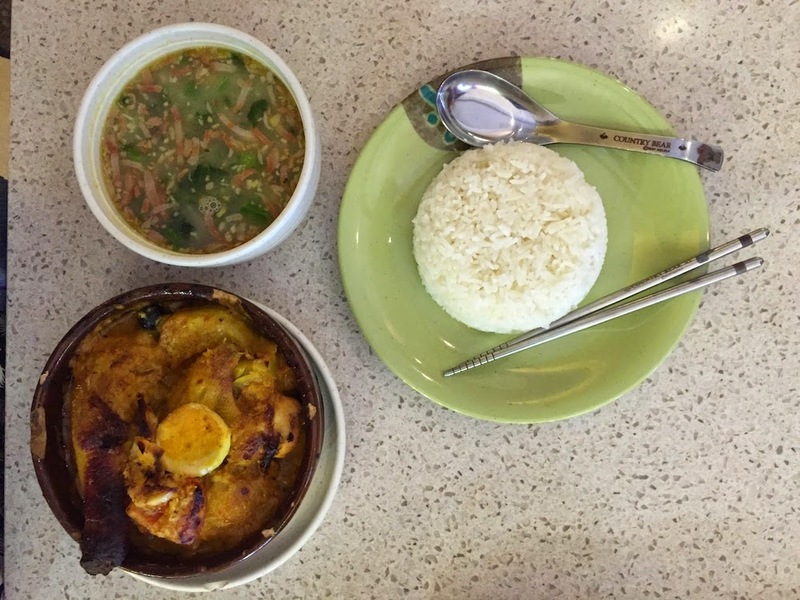 We were told to try the Portuguese-Macanese food in Macau so we decided to give this one a try. I thinks it's affiliated with an actual standing restaurant in Macau somewhere. We ordered from their list of popular dishes which included braised oxtail and their curry chicken. Both really flavorful dishes and I wasn't disappointed at all. 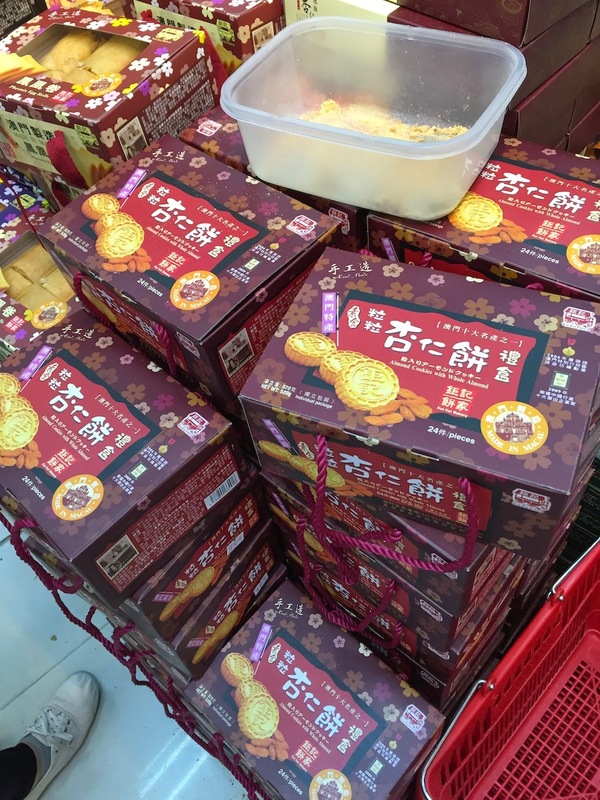 A friend asked us to pick up some almond cookies from Koi Ke Bakery to bring back. About one out of five tourist were holding bags of baked goods from Koi Ke Bakery. We were curious as well. What's the big deal. Dave picked up a couple of almond cookies which I only tried when we gave them to our friend. They are pretty good! My mom was more interested in the meat jerky they had on display. She tasted almost all of them before picking one. After almost a whole afternoon at the Venetian hotel and watching The House of Dancing Water at the City of Dreams (Watching the show was unplanned and my parents highly enjoyed the show. ), we went back in the city to visit the UNESCO protected Historic centre of Macau. There were a few restaurants and many egg tart places. I didn't believe in any of the restaurants here. It could or could have not been some tourist traps, we didn't know. It was quite late already so we didn't feel like taking a cab to go to one of the recommended restaurants for crab congee so we ended up going to one of the first restaurant we saw inside the historic centre called Wong Chi Kei. 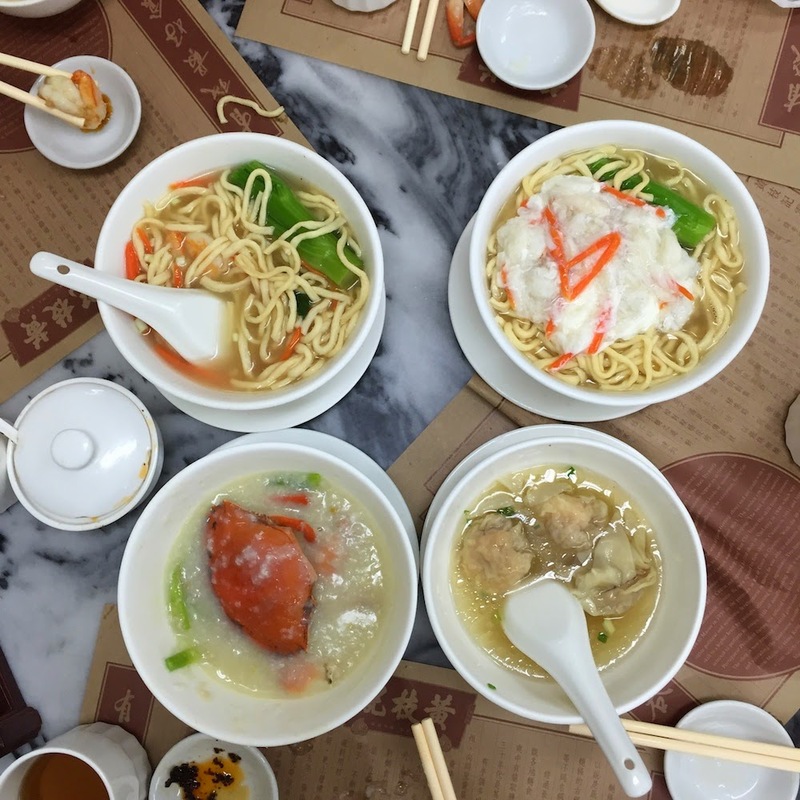 We tried their famous egg noodles, wonton noodle soup and crab congee. Overpriced and the food was just okay. They also have Wong Chi Kei at the airport. On day 3, Dave went to visit his relative while I took my parents around. 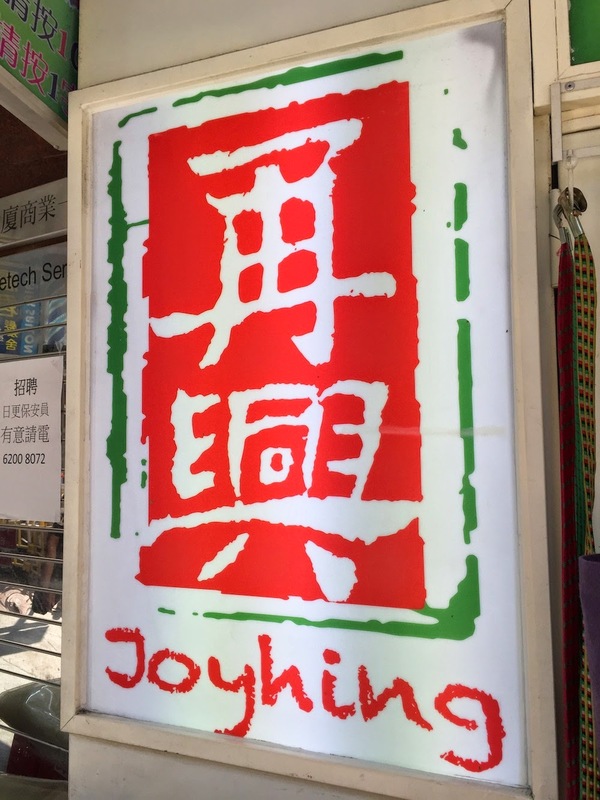 Our first stop was Joy Hing just a few blocks from where we were staying. 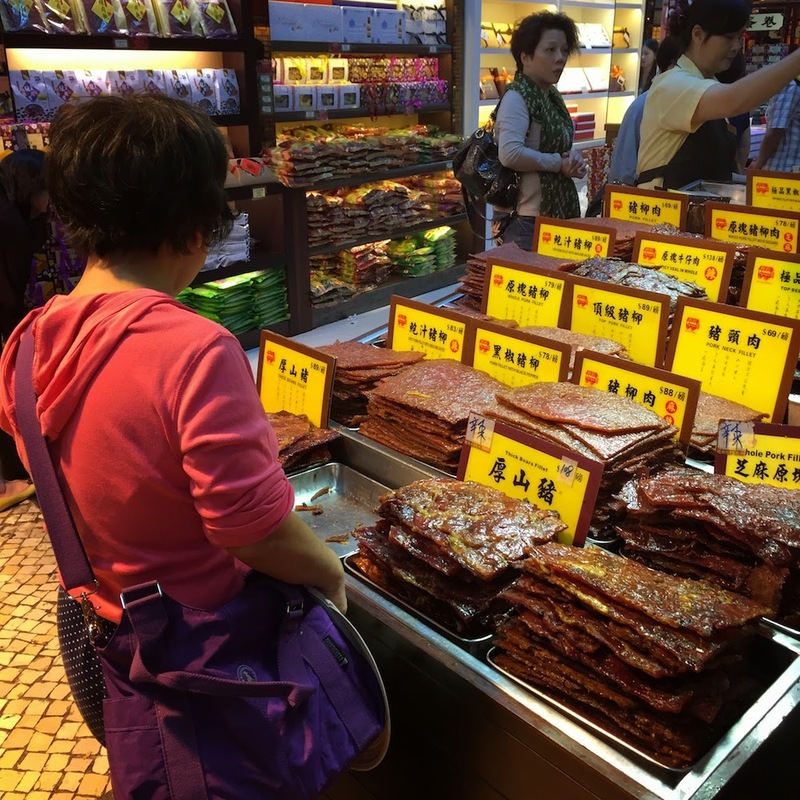 It's known for its char siu. 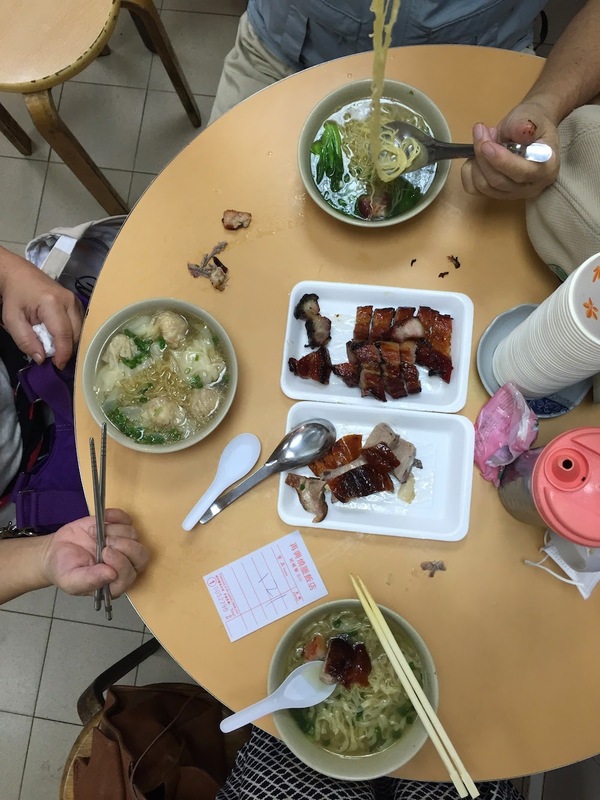 We had char siu and won ton noodle soup. I think my parents were not impressed but I kind of liked the smokey char siu. We took a long ride on the tramway across the entire city and got off Central so we can take the mid-level escalators up the hill. I highly recommend taking the tram. We were only planning to take the tram from Wan Chai to Causeway Bay but due to the protests at the time, the tram could not go in that direction. Since my parents enjoyed the tram ride, we decided to stay on and ride it all the way to the other end of the city (Kennedy Town Terminus). See my tramway post here.We had to switch trams at couple of times but since it was only $1.10 HKD (less than 15 cents USD) for seniors and $2.30 hkd for adults, we didn't mind at all. My parents were really happy public transportation is so cheap for seniors. 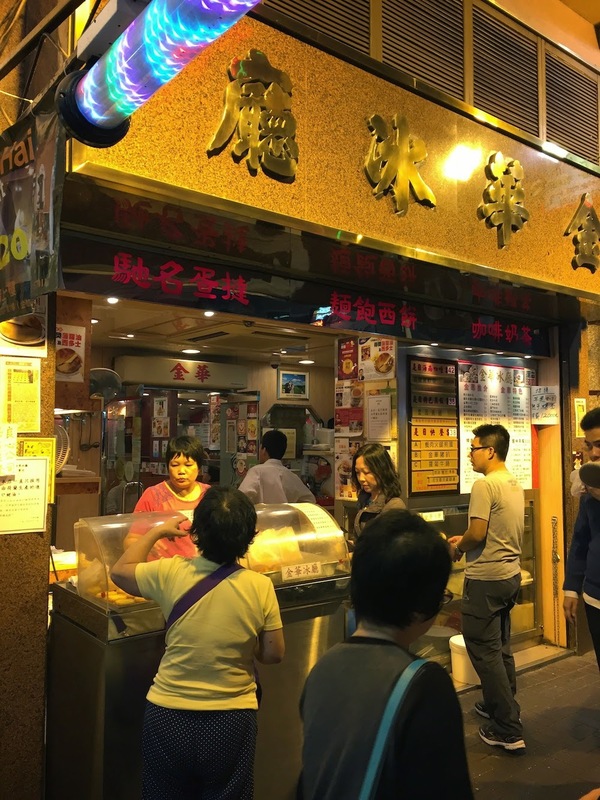 Mid-way up the Central mid-level escalators, we stopped at this famous milk tea joint recommended by a few people called Lan Fong Yuen. Even my mom who was afraid she would not be able to sleep from drinking tea decided to order a cup. There was no time to eat here. 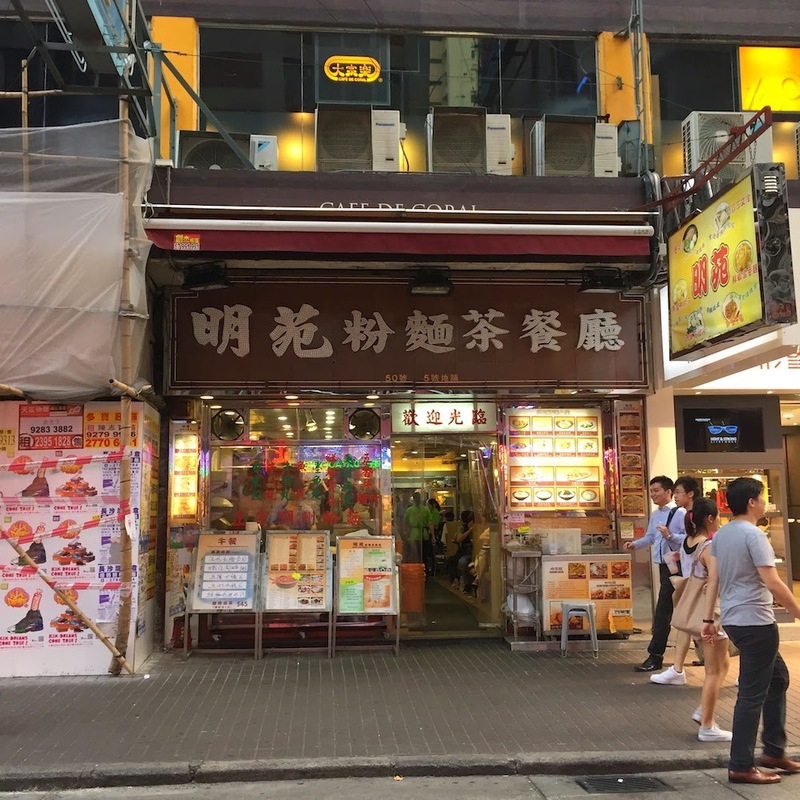 After visiting the Dr. Sun Yat Sen museum off Caine Street near the top of the hill (all unplanned), we slowly walked back down to Central and visited the numerous shops along the way. 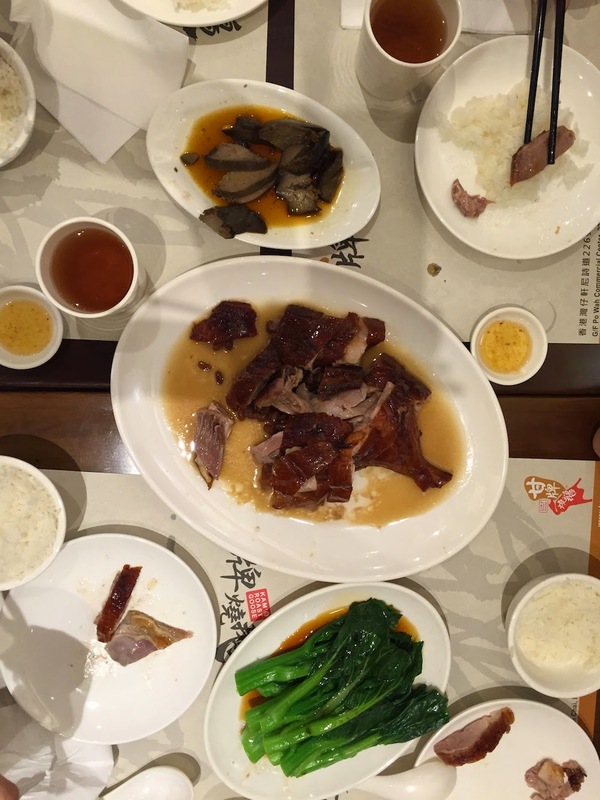 We decided to give roasted goose another try and went to multi-award winning (ex-Michelin star restaurant) Yung Kee. It has mixed reviews and it's a bit fancier and cleaner than the other place we had tried but mama was feeling generous so we gave it a try. The roasted goose was meatier and better than what we had on day one. We tried a few things recommended by the chefs. 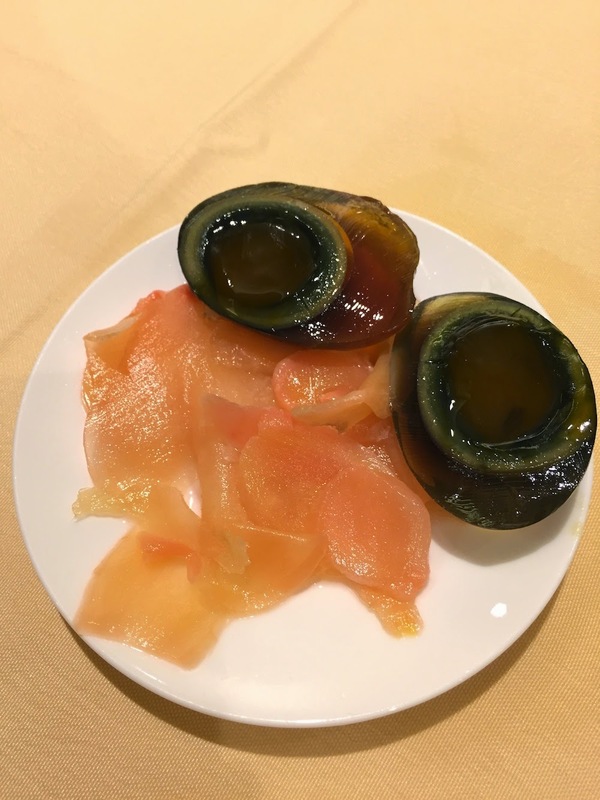 The preserved egg and pickled ginger seem like a popular dish so we went for that. I loved it. I have a thing for preserved eggs! We ordered some dim sum. My dad thought the food was good but I didn't think it was very spectacular. 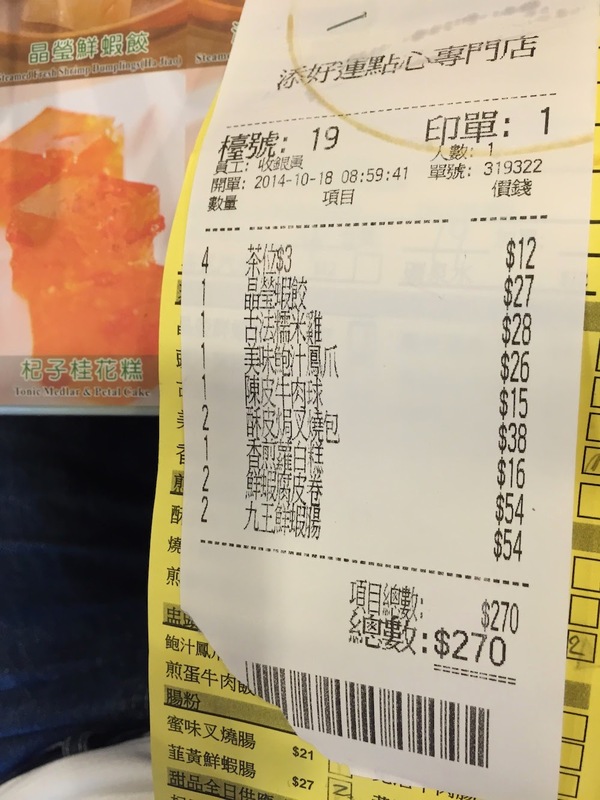 It was maybe not worth the price since we could probably get the same tasting food elsewhere for a lot cheaper. The restaurant was also pretty empty but we were also there late in the afternoon having a late lunch. Oh yes, that morning after our char siu breakfast, we tried some pineapple buns from Honolulu coffee shop on Hennessy Road. 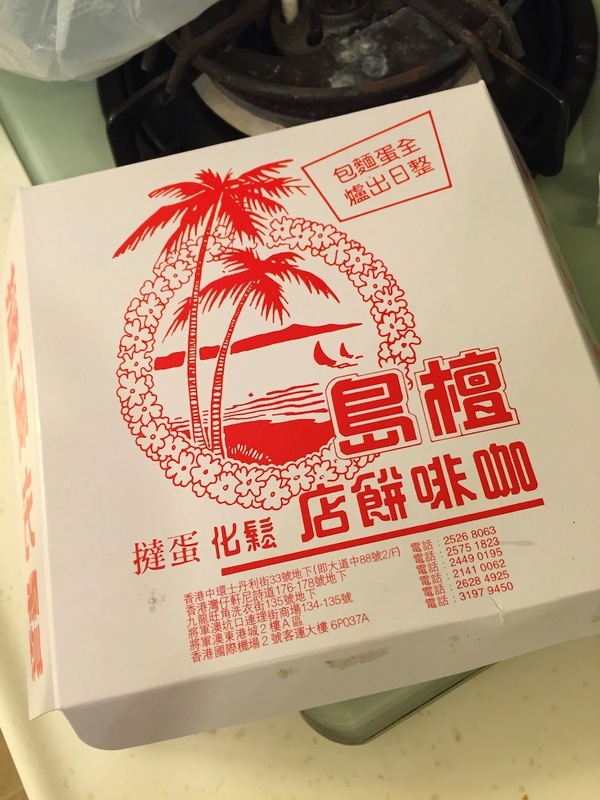 I forgot to take a picture of that but Dave came home with some egg tarts from there and I took a picture of the box. I remember not being hungry at all on day 3. On our last day (day 4), we were thinking about the char siu buns at Tim Ho Wan again and the bean curd too so, we went back. Why not? 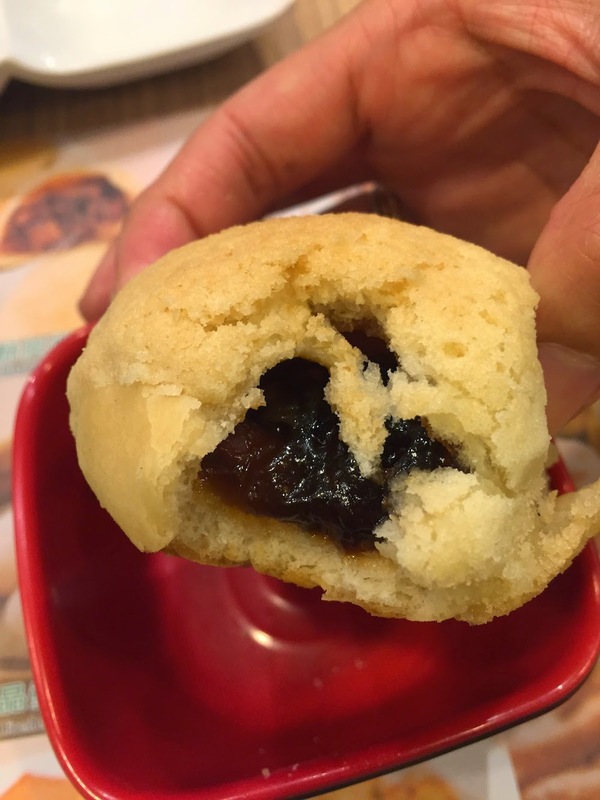 A Tim Ho Wan actually opened in Taipei not too long ago but my parents thought it would definitely not be the same thing. We ordered even more than we did the first time around and we were one less person. 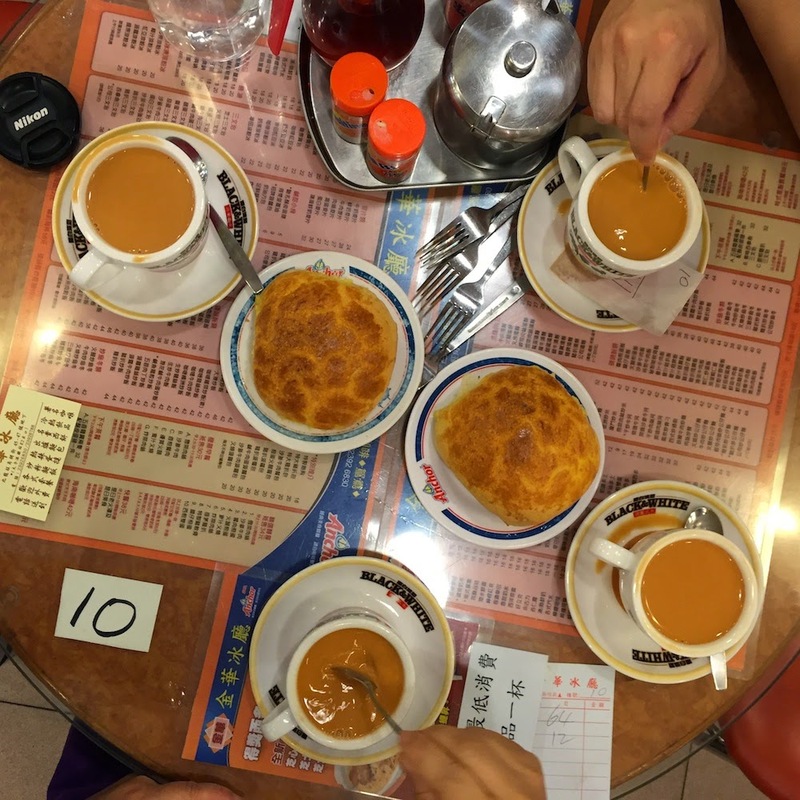 Our last meal in Hong Kong was by the MTR stop where we got off to visit Tian Tan Buddha. 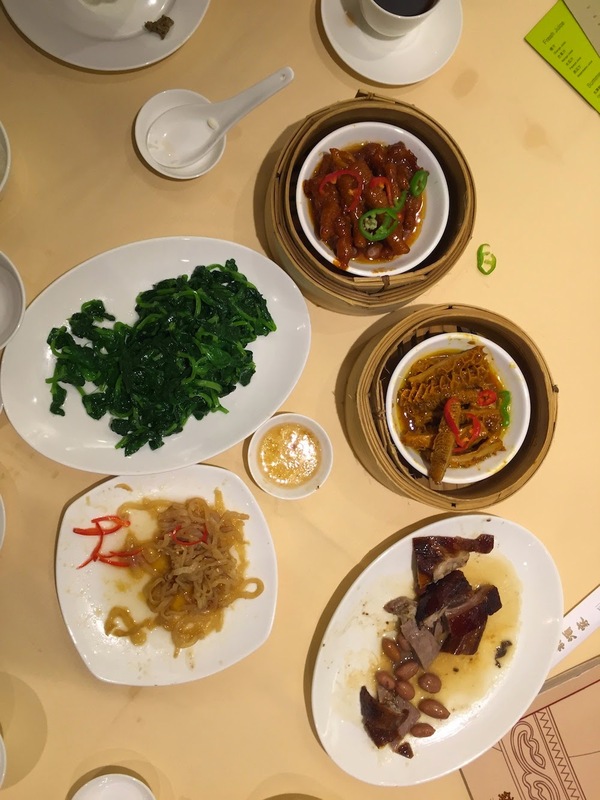 After walking for a couple of hours, we were a bit hungry and short on time so, we went to the food court inside this crowded mall and was enticed by the Szechuan/Cheng Du menu. The food was not good at all. My mom was a little saddened that we had to eat this dreadful (salty) meal on our last day. Since we were trying to eat before heading to the airport, we didn't realize there was probably better food at the airport and should have not eaten at a touristic hotspot. And voila, I think I covered it all. We didn't even try more than one fourth of all the recommendations. Four days is simply too short especially when we also wanted to do some sightseeing. But sightseeing is good. 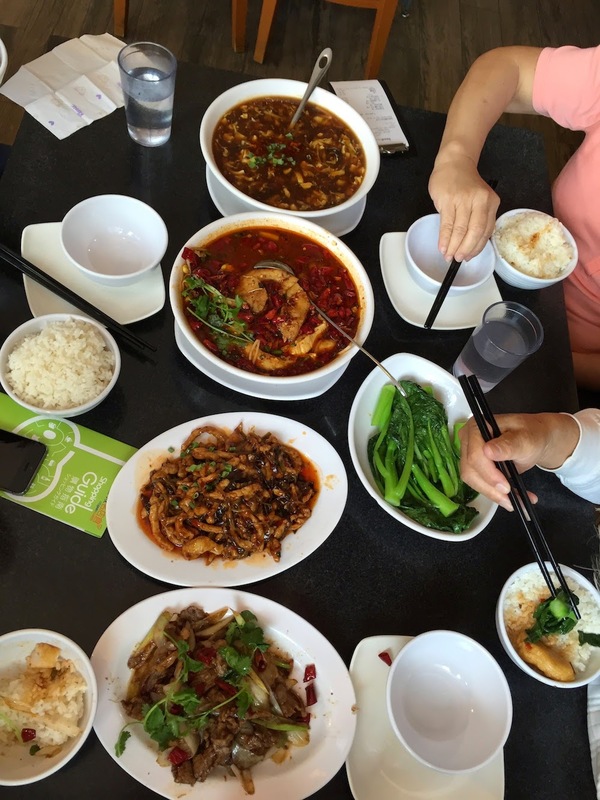 The more you walk, the more appetite you get. My parents did a fantastic job at eating. When I see them eat, I know why I am the way I am.